Hamshop is the official importer, distributor and dealer of Microham products. All products listed on the website are in stock. Microham manufactures the very best interfaces! With these Microham interfaces, you can send and receive HamRadioDeLuxe and all other digital programmes and modes. The USB-2 does not feature a soundcard, but the USB-3 does (we recommend the USB-3). 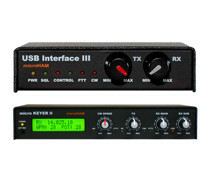 The Keyer 2 interface has multiple connections (extra CAT/CI/V port, microphone, morse key, PA, LNA). The interface can operate without a PC and has an excellent display!